Retail for $14.99 CAN in most drugstore changes I found. 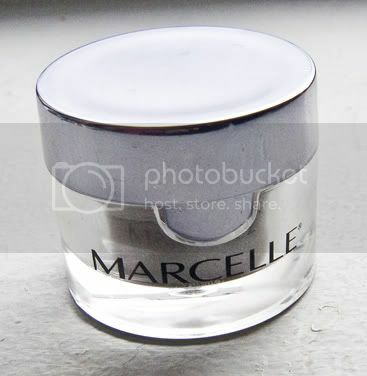 Marcelle Lux Eye Dust are kind of expensive for a pure pigment product with only 1.0g of product. If you look at similar products you can get pure pigment with binder for $10 to $13 at 2.5g. Product: This shade is finely milled so when applied wet it gives a metallic finish to the shade. There are no binder in this product making it shelf life longer as the dry and hostel to organic contaminants. Colour: Metallic mushroom the remind me or Urban Decay's Mushroom shadow you can only get in palettes. I'm happy to have gotten this dupe. There are a total of 10 shades in this collection. Wear: Foil/apply wet this puppy on as there is no binder/base unlike MAC and Ingot pigments, so applying it wet will yield the best result or use a sticky base. Packaging: Overly bulky for it's needs, but it definitely drop-proof with it's rubber plug cap. Another thing is until you open it the product look bigger then what it is through to naked eye. Compare: There are plenty of pure pigments with a similar base out there for cheaper so keep an eye out of sales on this line. Verdict: Price point in the drugstore line doesn't make this a must have for me but I'll be keeping an eye out for BOGO sales on the rest of the shades.